Sure, you've got your Flickr, your Picasa, your MobileMe galleries: There are all kinds of places to post your photographs online. But there's way more to online photography than sharing snapshots from your last vacation. Here are eight of my favorite places to enjoy photography on the Internet. There are untold numbers of one-of-a-kind film prints floating around out there in the non-digital world; luckily, many of them are in the collections of public libraries and museums. Many of these institutions have taken on the formidable task of scanning and publishing those collections online. One great example is the New York Public Library Digital Gallery. Launched in 2005, the NYPL scanning project has created a searchable online database of photographs—as well as maps, rare books, posters, and other gems—from its collection. Though huge, the online collection is amazingly only a sliver of the NYPL's total holdings, with more files being added every day. You can search the 700,000 images by keyword or browse by category; you can also browse by department or check out the library's Flickr feed. The scans are mostly 72 dpi images, but high-res prints are available for purchase. You don't even need a library card (but you should have one anyway). Good photographs are about more than their subjects. So it makes sense to organize them by something other than keywords. 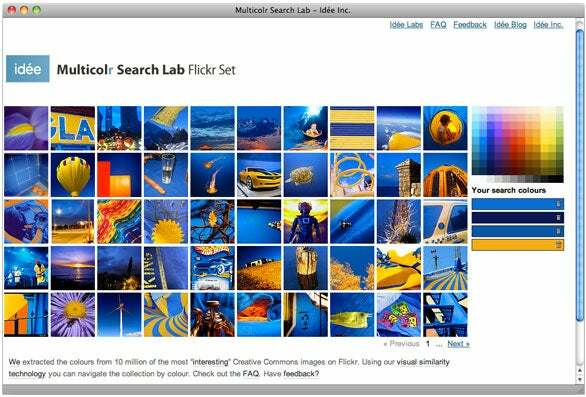 As the name implies, the Mulitcolr Search Lab from Idee Inc. lets you look for photos by color. You can select up to to 10 different colors from a palette—even the same color multiple times to increase its presence—and Multicolr searches over 10 million Creative Commons images on Flickr. A collage of thumbnails is updated immediately after each selection is made. Click on an image and its Flickr page will open up in a new tab. Multicolr is particularly useful for designers and photographers who are looking for a specific shade in an image, or just a splash of inspiration. There's been a surge in image-based social bookmarking sites in recent years. FFFFOUND! was one of the first, but you'll either have to wait for an invitation or be content with just browsing (which is satisfying enough). There is a less exclusive alternative: vi.sualize.us. Sign up for a free account and download the browser plug-in. Then, when you come across an image anywhere online that strikes you, right-click and select Add Image to vi.sualize.us, and type in a few tags for organizational purposes. When you're not saving images for inspiration, you can spend hours following all kinds of visual tangents in other community members' collections. For the past 20 years, the Hubble Space Telescope has been gathering data about nebulae, galaxies, planets, and other celestial bodies. 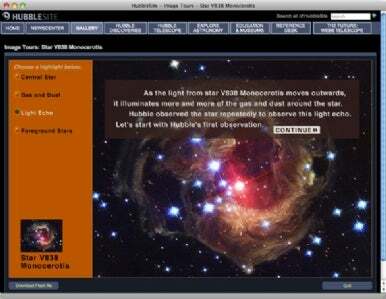 To let the general public in on the action, the agency that operates the telescope created HubbleSite. The highlight of the site is the Gallery section, which contains hundreds of stunning, high-resolution images from space. You can browse by subject or take educational image tours—Flash movies for specific images that explain exactly what you're seeing. Each image is available as a free download in a variety of sizes, many extremely high-resolution. (There is one image of the Carina Nebula that's a whopping 29566 by 14321.) The site also has explanations of how the images get their colors (since the original Hubble photos are actually black and white), as well as step-by-step instructions for making quality prints. 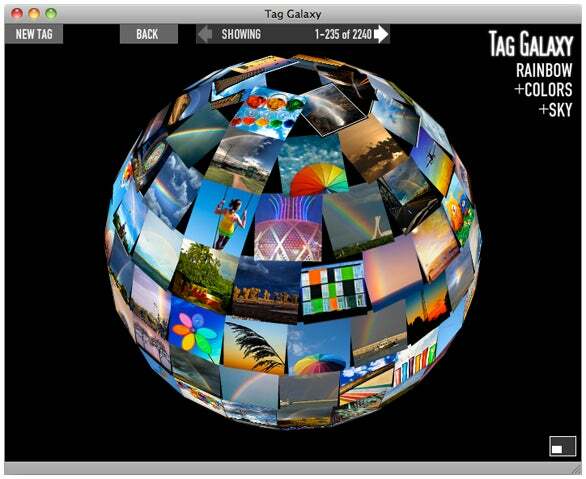 While you're on a space kick, check out TagGalaxy, an interactive Flash search tool for Flickr. Type in a tag and you'll see it visualized as a sun, with planets representing related tags floating around it. You can select one of those tags to add them to your search. When you've collected all the tags you want, click on the sun and watch as a 3D-sphere appears and is blanketed in relevant images from Flickr. You can spin the sphere around with your mouse and click on an individual image, which brings up a detailed view and an option to go to that photo's Flickr page. It's not a revolutionary way of navigating Flickr, or even a terribly efficient one, but there's no denying it's fun. Another unique way to work with images online is with TinEye, a sort-of reverse search engine. Instead of looking for images based on words, you start by uploading a specific image or URL for an image, and TinEye will look for other occurrences of that picture on the Internet. TinEye uses image recognition technology that finds your exact image—and slightly altered versions of it—but not similar images. It's a great tool for photographers who want to know if someone is using their work without permission, or for designers who want to use an image they found online, but need to track down the original owner. It's also handy for finding high-resolution versions of a small image. The limitations of connection speeds and monitor space have created a low-res monster. Photographers are taking 20GB photographs with their expensive DSLRs, and we're stuck viewing them online as low-quality 72 dpi jpgs. High-resolution images get a chance to shine at Gigapan.org, which plays host to a growing collection of interactive gigapixel photographs. (A gigapixel image contains one billion pixels.) 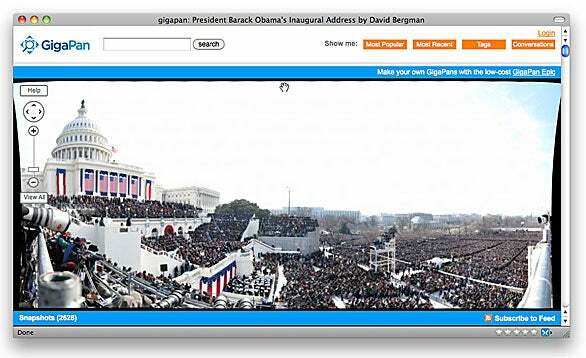 For example, this 1.47 gigapixel image of Barack Obama's inauguration was stitched together from 2,627 smaller shots. With a few clicks, you can zoom in and see the expressions of individuals in the crowd. Gigapan recommends gigapxel photographers use the $896 Gigapan Systems Epic Pro, a specialized camera mount for taking gigapixel images. The Boston Globe's Big Picture blog puts photojournalism front and center. Instead of using images to illustrate a news article, the site makes photographs the main attraction, accompanied only by a brief caption. Picked up mostly from the wire services, each photo is hand selected by Alan Taylor and posted at 990 pixels wide, filling up your browser window. The subject matter is varied, alternating between serious news like Afghanistan and lighter fair like fluffy bunnies (really). The Big Picture is a refreshing and vivid way to experience the day's news.